A PDF version of this transcript appears in the March 11, 2016 issue of Executive Intelligence Review and is re-published here with permission. Read more about this historic event here. March 2, 2016 —Helga Zepp-LaRouche, founder of the Schiller Institutes, spoke in New Delhi today at the annual Raisina Dialogue, co-sponsored by the Indian Ministry of External Affairs and the Observer Research Foundation, an independent public policy think tank based in India. The two-day conference is described by its organizers as being “designed to explore prospects and opportunities for Asian integration as well as Asia’s integration with the larger world.” The event hosted more than 100 speakers from over 100 countries. An edited transcript of Helga Zepp-LaRouche’s address follows. Moderator: Now we have Mrs. Helga Zepp-LaRouche to speak on the Chinese Belt and Road initiative. . . . You have the floor. Helga Zepp-LaRouche: Thank you very much. I want to thank the organizers of this very distinguished forum for giving me the opportunity to speak, because I think most people know that mankind is in one of its most severe crises, and perhaps the most important crisis in all of our history. The strategic situation is described by many analysts as more dangerous than during the height of the Cold War, at the time of the Cuban Missile Crisis. The trans-Atlantic financial system is headed for a new crisis, worse than 2008, and the refugee crisis in Europe is really not only a tremendous humanitarian crisis, but it is about to explode the European Union. Now, the question is, are we, as a human civilization, capable of changing wrong policies which have led to this crisis, or are we doomed to repeat the mistakes which have led, due to geopolitics, to two world wars in the Twentieth Century? But fortunately, we are also witnessing the emergence of a completely new paradigm. Under the leadership of the BRICS countries, a completely new set of relations among states is developing, based on mutual interest, economic cooperation, and collaboration in future-oriented, high-technology areas such as thermonuclear fusion, and space exploration and research, leading to a deeper understanding of the physical principles of our universe. The Chinese New Silk Road program, One Belt, One Road, is offering a replication of the Chinese economic miracle to every country which wishes to cooperate in this win-win perspective. Already 65 states are participating in this new model of cooperation, and it is in the process of overcoming geopolitics, and thereby the source of war, potentially forever. The new agreement between U.S. Secretary of State John Kerry and Russian Foreign Minister Sergey Lavrov for a ceasefire in Syria, is potentially a game-changer for the entire strategic situation, provided that especially Russia, China, and India immediately work with the countries of Southwest Asia to implement a comprehensive build-up program, not only for the war-torn countries of Syria, Iraq, and Afghanistan, but for the entire region from Afghanistan to the Mediterranean, from the Caucasus to the Persian Gulf. And with the trip of President Xi Jinping to the region—to Iran, Egypt, and Saudi Arabia—the extension of the Silk Road is now on the table. 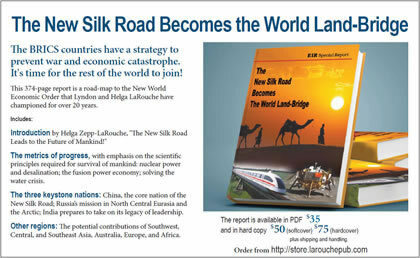 The Schiller Institute published a 370-page study with the title, The New Silk Road Becomes the World Land-Bridge, which is already available in translation in Chinese, in Arabic, and soon in Korean, which is a blueprint for a comprehensive build-up of the whole world economy. It contains a very concrete plan for Southwest Asia. So this region, between Asia, Europe, and Africa, has a huge development potential, with great human and natural resources, and it is uniquely located. The Five Seas strategy announced in 2004 by President Assad can still be a reference point for an infrastructure network between the Mediterranean, the Indian Ocean, the Red Sea, the Caspian Sea, and the Black Sea, making this region potentially a prosperous hub for vast increases in trade among Asia, Europe, and Africa. Two major development corridors, one east-west, and another one north-south, will not only include integrated fast train systems, highways, pipelines, water projects, industrial development, and agriculture. With modern technologies—such as nuclear energy for the desalination of vast amounts of ocean water and the ionization of moisture in the atmosphere—we can green the desert and reconquer large desert areas for agriculture and human habitation. The New Silk Road, which already extends from Chongqing and Yiwu to Tehran, where the first Silk Road train arrived from Yiwu three weeks ago, can be extended from Tehran via Baghdad, Amman, and Aqaba, and then continue through a tunnel to Sharm el-Sheikh in the southern Sinai to Cairo. The route crosses the Euphrates River, where ancient travel routes can be transformed into modern corridors, from the port of Basra in Iraq at the Persian Gulf, northwest to Aleppo. Existing railroads along the Euphrates in Iraq and a railroad between Aleppo and Deir ez-Zor on the Euphrates in eastern Syria, should be modernized, and a new line from there to Baghdad, connecting the main arteries of the Silk Road, should be built. Again, this corridor should not just be rail, but should integrate transport, energy production and distribution, and communications, and should create conditions governing the location of new industrial development and new cities. A land route to India connecting the Iranian rail network to Zahedan on the Iran-Pakistan border, is on schedule to be completed. Other lines, for time reasons very briefly: from Deir ez-Zor to Tadmor-Palmyra to Damascus and Beirut; A north-south link from Syria to the industrial zones of the Suez Canal; a north-south railway from Damascus to Mecca and Medina; a tunnel under the Bab el-Mandeb Strait from Djibouti to the Arab Peninsula; and links to Europe, the Black Sea, and Russia. India has good relations with practically all of the countries of the region and has already been asked by Russia and China to play a mediating role in such a developing perspective. As Prime Minister Modi has said, 65% of the Indian population is under 35 years of age, and that is the greatest asset of the country. These youth must not only be given a vision to increase the productivity of Indian agriculture—through the use of power, water, fertilizer, and high-variety seeds—so that the number of people working as farmers can be halved and that land be used for a build-up of infrastructure. But the youth of India can also be inspired to take it as their own mission to participate in the economic transformation of Southwest Asia and Africa, and in this way, to be part of creating a future for all mankind.